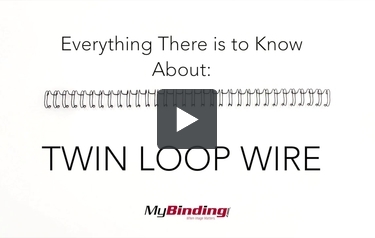 The second most popular color in the business world, our available silver twin loop wires are a great tool for sharing information in a professional presentation. We carry not just our own brand, but also GBC and Renz. And we carry 3:1 pitch, used for document sizes 1/4" to 9/16" and 2:1 pitch, for 5/8" to 1-1/4" document sizes. We offer various lengths of wires plus the option to get a spool of twin loop wire, for custom lengths. And don't forget-make sure your machine is compatible with whatever type of wire you get! 2:1 silver twin loop wire with a gloss finish. Premium silver 2:1 wire with a polished finish.